For the first time since DCC started, I attended in plain clothes. (Well, I did get to debut my new Captain Marvel Vans.) It was a strange feeling, dressed as a Muggle in a sea of fabulous cosplayers. However, the opportunities afforded me at this year’s con far outshone my ‘lack of costume’ fomo. Thanks to my friend Amalie Howard, I got to moderate two very cool panels, one on kissing and one on monsters. It was excellent to speak with authors like Christopher Paolini and Naomi Novik. Writers I truly admire! Lucky me, I also was invited to participate on two panels. The first was a think tank for YA novel ideas – my role was the kind, creative writing teacher. 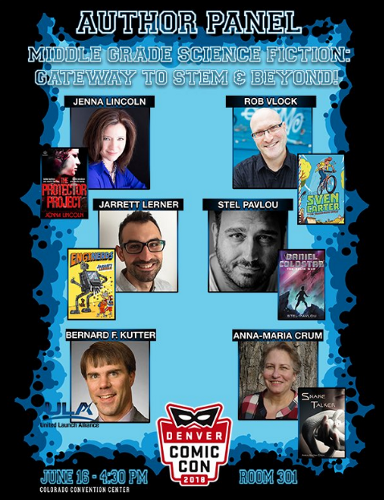 The final panel was about bringing science fiction into the classroom as a gateway to STEM. If you’re in the neighborhood next DCC, please find me and say hello!